John F from Port Richey, Florida, asks Chapter 7 Bankruptcy, please explain. Chapter 7 Bankruptcy is a type of Bankruptcy that is organized under Chapter 7 of the Bankruptcy Code. Chapter 7 Bankruptcy is sometimes called a Straight Bankruptcy or Straight Liquidation. However, the majority of our clients who file Chapter 7 Bankruptcy do not suffer the liquidation of any of their assets. 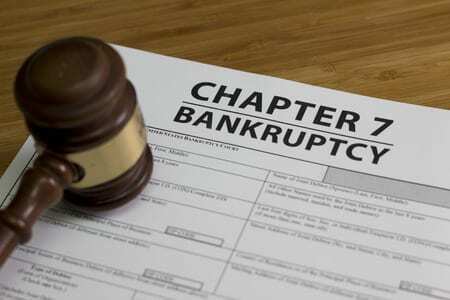 When one files Bankruptcy, whether it is a Chapter 7 Bankruptcy, or a Chapter 13 Bankruptcy, the filer or debtor, is permitted certain Exemptions. Exemptions are provisions of either State or Federal Law, that determine what assets the debtor may retain, free from seizure by the Bankruptcy Trustee, or free from a determination in a Chapter 13 Bankruptcy, that the debtor must pay additional monies to the Chapter 13 Trustee, in recognition of the non-exempt portions of such assets. For example, a debtor who owns an automobile, in Florida, is generally permitted an Exemption of $1,000. If the debtor owns a Homestead, that is the limit of the Exemption under the Florida Exemption Statutes. If the debtor does not own a Homestead in the State of Florida, or otherwise decides to surrender such property through the Bankruptcy, the debtor is afforded a super-exemption, which greatly expands the protection of the automobile asset. There are a myriad of Exemptions that the Chapter 7 Debtor may employ in the protection of his or her assets. The Homestead Exemption, the Automobile Exemption, and the Personal Property Exemption are the most commonly used Exemptions. In addition, there is an Exemption that governs retirement accounts, and other less commonly used Exemptions. One may file and receive a Discharge in a Chapter 7 Bankruptcy every 8 years. The 8 year term runs from the filing of the Chapter 7 Bankruptcy. To qualify for a Chapter 7 Bankruptcy, the debtor or debtors income must generally not exceed the median income of such Debtor or Debtors, as determined by family size. The median income determinations change, depending upon what State the Debtor or Debtors reside. Generally, one files a Chapter 7 Bankruptcy if he or she is seeking to Discharge what are referred to as Unsecured Debts. Unsecured Debts are Debts that are not secured by some form of collateral. An automobile loan is generally a Secured Debt because the Creditor takes a lien upon the automobile as security for the payment of the obligation. If one falls delinquent upon an automobile loan, the Creditor may repossess the automobile, and thereafter, sell the collateral, in order to recapture its losses. An Unsecured Debt has no such security. Forms of unsecured debts include most credit cards, medical bills, cell phone bills, utilities, and repossessed automobiles. Sometimes, tax debts are considered unsecured and dischargeable debts that may be eliminated through the process of a Chapter 7 Bankruptcy. While student loans are considered unsecured debts, such loans are generally not dischargeable in a Chapter 7 Bankruptcy. There are however, exceptions to this standard rule, where student loans may be discharged based upon a showing of undue hardship, or other considerations. If you have student loans, the bankruptcy attorney can advise you regarding the likelihood that such loans could be discharged in a Chapter 7 Bankruptcy. The unsecured debt that is probably least likely to be discharged in a Chapter 7 Bankruptcy is child support or alimony obligations. Again, there are no absolute rules in Bankruptcy Law. One needs to consult with an experienced and knowledgeable bankruptcy attorney in making these determinations. Chapter 7 Bankruptcy has progressively become a more complicated subject of law. The Bankruptcy Act of 2005 created some additional obstacles to those seeking relief through Bankruptcy. In addition, the Bankruptcy Courts are continually adopting a more creditor friendly stance, along with the US Trustee Office. Although such complications exist, a Debtor seeking relief from his or her creditors through a Chapter 7 Bankruptcy, can typically find such relief. For the bankruptcy attorney, this requires a more serious and knowledgeable approach to the representation of his or her clients in Bankruptcy. If you are considering whether to file Chapter 7 Bankruptcy, Chapter 13 Bankruptcy, or some other Chapter of Bankruptcy, please contact our office. Our office also provides what we term non-bankruptcy alternatives, to help those confronted with unmanageable debts. There is generally a solution available to all those who approach our office. Weller Legal Group, PA has offices in Clearwater, Port Richey, Brandon and Lakeland, Florida. Each of our offices are conveniently located within such localities, making easy access to those arriving outside such locales. If you are considering whether to file Bankruptcy, or seeking redress through means outside of Bankruptcy, please contact our office today, toll free at 1-800-407-3328 (DEBT). You may also contact our office through the website, www.jayweller.com. Clearwater Bankruptcy Attorney Jay Weller provides legal representation in bankruptcy, foreclosure defense, debt reorganization, settlements, credit counseling and all other matters relating to debt. © 2019. Weller Legal Group PA. All rights reserved. Sitemap.